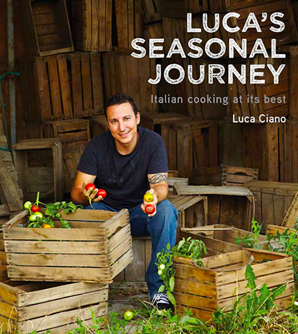 Luca’s Seasonal Journey is an incredibly beautiful hard-cover cook book that would do just as nicely on your coffee table as it would on your shelf beside your Italian herbs. The attention to design and presentation takes some of the familiar and even humble recipes, to creative new heights. There’s the red onion and courgette frittata with gorgonzola, a very simple and yet deeply alluring dish that oozes warmth and family get-togethers. It’s similar to the tomato soup with crostini that normally would seem quite unobtrusive but is bursting with flavour on the page and in the bowl too! Luca Ciano certainly seems to love fresh vegetables and you’ll see zucchini, artichoke and asparagus in more than a few recipes, so if they’re your favourites then you’ll get plenty out of this selection of recipes. There’s also a good spread of different kinds of pastas inclining risotto, gnocchi, orecchiette and all the recipes, as the title indicates, range across all four seasons. Admittedly, there isn’t too much that would surprise the Italian foodie. There are some excellent staples including minestrone soup and some lovely desserts such as pineapple sorbet with pineapple crisps and banana ice-cream but unless you own a ice-cream machine it’s far more likely you’ll follow the quick and easy way to make ice cream via YouTube. One of my favourites is the buckwheat pasta with silver beet, potatoes, butter, sage and bitto cheese. I left out the potatoes (too many carbs) but the combination, although familiar, never ceases to be a happy explosion of flavour. If you’re a fan of figs there are also some exceptional recipes that will have your guests begging for more, especially as in New Zealand our figs are so sweet. Try the pannacotta with figs marmellata and cantucci biscuits or if you want something easier the honey roasted figs and prosciutto bruschetta with burrata is easy and requires minimal fuss. There’s also plenty of polenta options (yes, there’s chips!) but also braised beef, an option of polenta with octopus and, of course, polenta with the classic Italian sausage. There’s plenty to admire about this trip through the four seasons in Italy and while the recipes may not be startlingly unique they are rustic, easy and most importantly, packed with flavour.